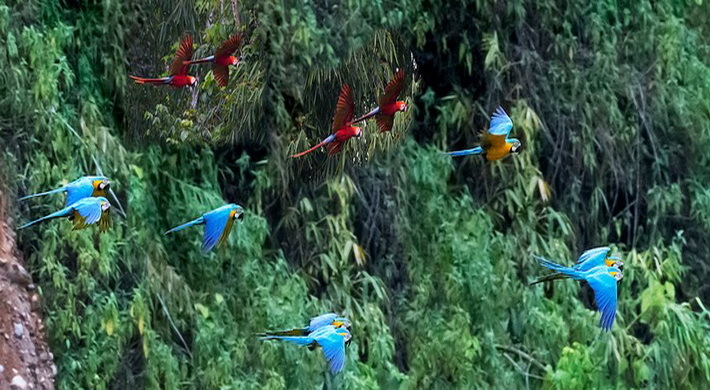 Travelling to Tambopata National Reserve offers a rare opportunity to discover a lively biodiversity of birds, mammals, reptiles, insects and trees. Record-setting numbers of animal species are concentrated within small areas, and the variety of plant life is greater than almost anywhere in the world. To help you experience the wonder of this magic place. Reception at the airport and transfer to the dock located in the native community of Infierno from where we board our canoe and start a one-and-a-half-hour journey to the Explorer's Inn. During the trip we have a lunch on board and may see caimans, turtles and capybaras, among other animals. We are received at the Inn with a welcome drink. After resting, we take a short night-hike to see nocturnal rainforest animals. Back at the lodge we have dinner with our guide and some of the Resident Naturalists who are available to answer questions or brief us about the Amazon rainforest and the Tambopata National Reserve. We breakfast and, at daybreak, board the canoe for a four-hour journey up the Tambopata River, deep into untouched Amazon rainforest with superb wildlife sighting possibilities. On the way we pass basalt rock formations, gold panning sites, wonderful sandy beaches where one can swim, arriving finally at the macaw clay lick, a 200-meter red soil cliff where, for reasons which scientists still do not fully understand, hundreds of macaws and other parrot species converge every morning and afternoon to feed on the mineral rich clay. Once installed at the campsite we have a box lunch. After a brief rest, depending on the season, we may swim in the river and/or go for a walk before having dinner at camp. Note: Depending on weather conditions, season and other factors, the activities on the second day may be replaced by the activities scheduled for the fourth day, with the excursion to the clay lick taking just one day. Early in the morning we view the macaws at the clay lick and then return by canoe to the Inn, lunching on board. We have the afternoon free. After sunset, we board the canoe again to observe caimans using torches. Back at the lodge, we have dinner with our guides and some of the Resident Naturalists.